Minimum Order 10 Tiles. We Can Sell to You a Smaller QUANTITY on the condition that you AGREE to pay $15.00 PACKING FEE to your order: Please call 800-349-5799. SKU: SKU0175 Categories: CEILING TILES ALL TYPES, Metal Ceiling Tiles No Discount Apply To These Products Lead Time Estimated 14 to 21 Working Days., Tin Metal Ceiling Tile 24x24, 12"x 12" Pattern on 24"x 24" Metal Ceiling Tile. Tinplate efficiently combines the strength of steel with tin’s luster, corrosion resistance and low toxicity. Most Tin Ceiling Tiles are tin-plated meaning they are made from sheet metal, thin coated with tin and in all likely hood will require painting. 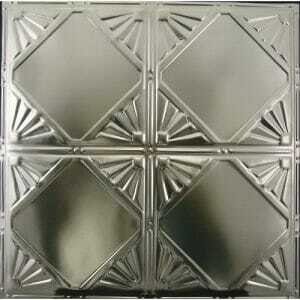 Another type of Metal Ceiling Tiles are those made from Unfinished . 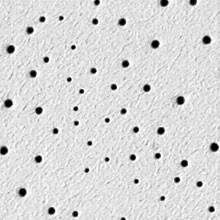 Ceiling Tiles made of Tin Metal (unlike raw tin-plated steel ceiling tiles) will not rust. Steel will rust even if coated with tin plating whereas will never rust. As with any unfinished Metal Ceiling Tiles they require painting. There are many Metallic Paints on the market and to purchase these beautiful Metallic Paints in for example Copper or Silver is very expensive and cost around $150.00 per gallon of paint. At Ceiling Tiles By Us we carry a wide range Ceiling Tiles made of Solid Copper, Tin Plated Steel & Plastic. All vary in price & all can create a Beautiful Ceiling Panel or Wall Panel. All Ceiling Tile Panels and Wall Panels are manufactured using a proprietary process, each individual piece is inspected in order to insure high definition of detail to the pattern. Authentic tin ceilings of yesteryear were made from tin-plated steel. Ceiling Tiles By Us Inc. offers tin-plated panels just like the originals. These panels provide tremendous value and are lower in cost than Ceiling Tiles By Us Inc aluminum and solid copper panels. However, tin-plated steel, like the original, could rust over time if exposed to water and/or humid conditions. Tin-plated steel panels also have sharp edges so it is recommended that installers wear protective gloves when handling. Traditional finish of White and Clear Coated tin ceiling tile finishes allow tin ceiling panels to be installed without painting. The Clear Coated tin ceiling finish provides a shiny metallic look that will last for years. The White tin ceiling tile finish provides a clean, crisp (matte) appearance that can be used as is, or as a primer base ready for top coating with any latex paint. Mill finishes tin ceiling tiles (in aluminum) and tin-plated metal ceiling tiles, while economical, require a coating before or after installation. View a list of all our available tin ceiling panel finishes. The Specialty Tin Ceiling finishes are definitely beyond the ordinary. They range from classic metallic finishes such as Polished Brass tin ceiling tiles and Copper tin ceiling panels to the subtly mottled and hugely popular look of Leather and Burnt Mahogany. All Ceiling Tiles By Us Inc Tin Ceiling Tile Specialty colors are rich, deep, and vibrant; and provide consistent coloration from tin ceiling panel to tin ceiling panel. Specialty finish Tin Ceiling tiles do not require additional coating prior to, or following installation. View a list of all our available tin ceiling finishes. The Premium Tin Ceiling finishes from Ceiling Tiles By Us Inc Tin Ceilings are created using a proprietary process that results in a dramatic two-toned or variegated finish. Each Premium tin ceiling panel finish provides an almost hand-applied look that uniquely enhances each embossed tin ceiling pattern. Premium tin ceiling tile finishes do not require additional coating prior to, or following installation. 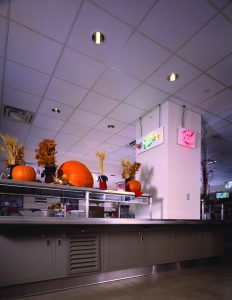 To assure the look is just right for you, Ceiling Tiles By Us Inc Tin Ceilings recommends that you order a full-size Premium Tin Ceiling Panel sample prior to placing a full order. 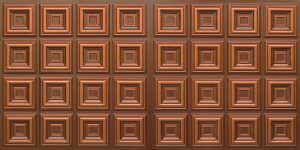 View a list of all our available tin ceiling tile finishes. Solid copper panels provide an expensive, sophisticated look to any room where they are installed. Since these panels are shipped without a coating, these panels will age over time taking on the rich patina of aged copper. The aging process happens slowly and it can be stopped at any time during the process. Once the copper has attained the desired look and appearance, applying a clear lacquer or latex topcoat will stop the aging process. This topcoat can be purchased at any local or national paint retailer. When handling a solid copper panel it is recommended that installers wear soft cotton gloves so as not to mar the finish with oil deposits during the installation process. The Artisan tin ceiling finished tiles are created and then hand applied by individual artists yielding a rich and refined custom tin ceiling finish that is truly unique and distinctive. Artisan finished Tin Ceiling Panels do not require additional coating prior to, or following installation. To assure the look is just right for you, Ceiling Tiles By Us Inc. recommends ordering full-size Artisan Finish Tin Ceiling Panel samples prior to placing a full order. 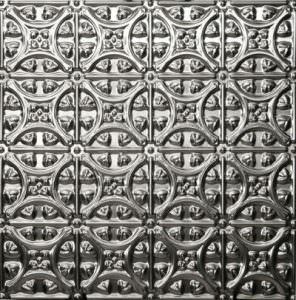 View a list of all our available Tin Ceiling Tile finishes.